Finding experienced, knowledgeable commercial roofing contractors for a building project in Tallahassee or any other surrounding city in Florida is as easy as turning to Arango Insulation. 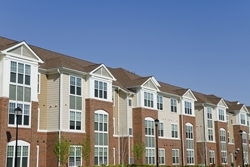 We are professional contractors who specialize in installing roofs on large-scale, multi-resident commercial structures like apartment buildings, assisted-living facilities, and condominium and townhome complexes. Our expertise in this area of construction enables us to perform installations quickly and efficiently while maintaining superior craftsmanship and exceptional service. At Arango Insulation, our team of highly trained technicians works under the close supervision of an expert project manager who ensures a meticulous attention to detail and quality from start to finish. As a result, you can feel confident knowing that the roof of your Tallahassee, FL, structure will be well-built and will last for years to come. Further, because we understand the importance of deadlines in commercial roofing jobs, our project manager is dedicated to making sure that your installation remains on schedule and is completed on time. For more information on how the commercial roofing contractors at Arango Insulation can install a long-lasting roof while keeping your Tallahassee, FL, area construction project on schedule, contact us today.